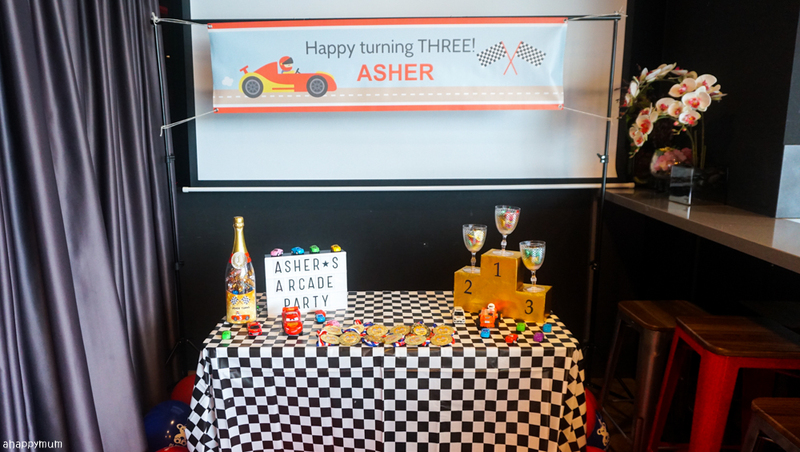 It's an ARCADE party - Asher turns 3! 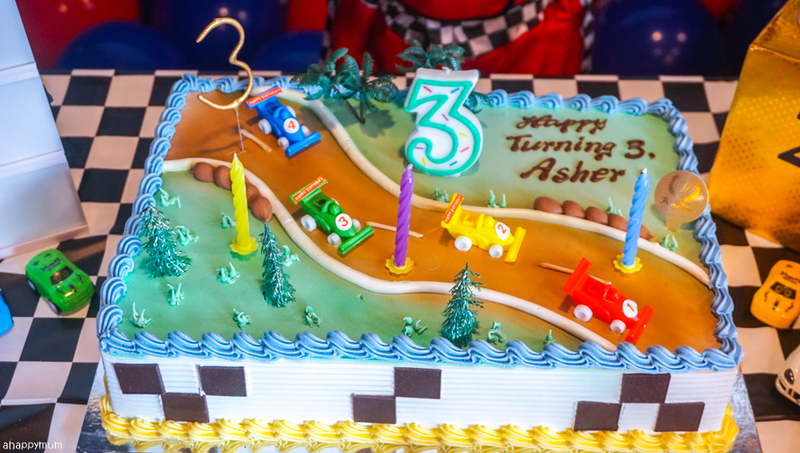 In the blink of an eye, the boy has turned three years old. I know, wasn't it just yesterday when I did a gender announcement using a volcano and we were looking forward to his arrival? 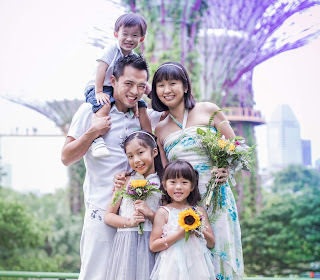 It's really baffling to me on how quickly time flies and when you look back on the years, you realise that your little ones are not so little anymore. 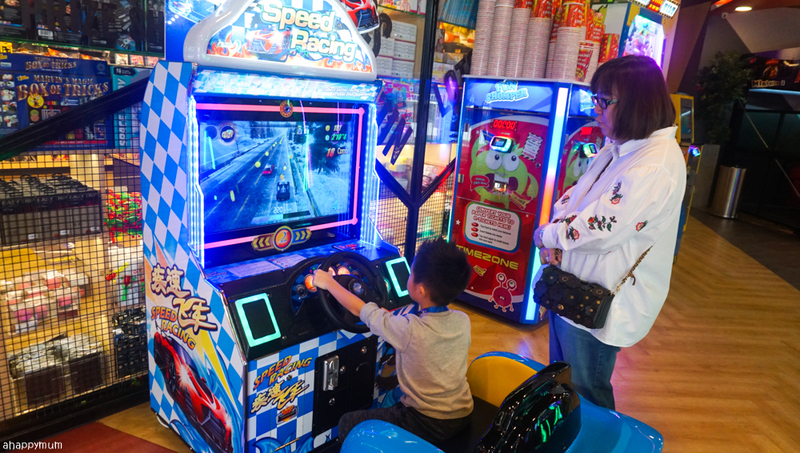 Anyway, he started hanging out at arcades with us last year and showed a keen interest in playing all kinds of games, from bowling and racing cars to gun shooting and ball games. 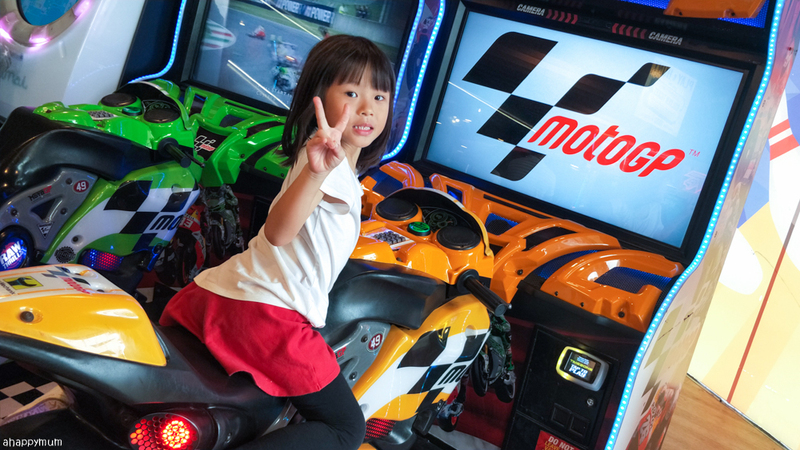 Yes, the arcade became our happy place and we would reward the kids with a trip there during the school holidays. 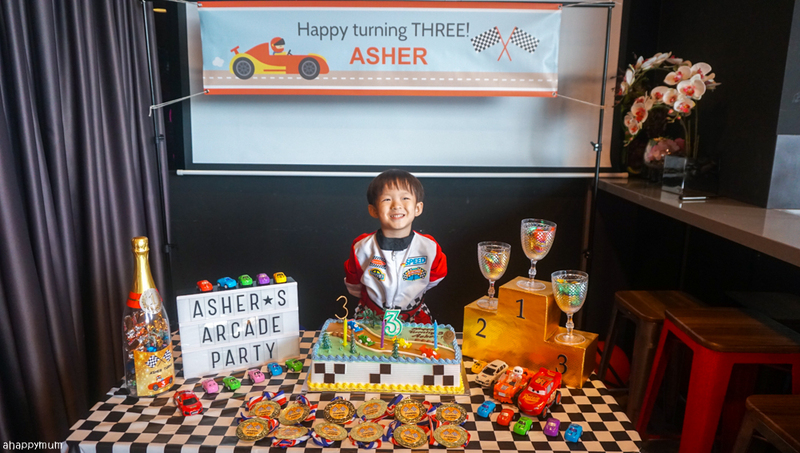 When I was planning for his third birthday party, I knew that it would totally be a blast if Asher could have an arcade themed party to celebrate his special day with his family and friends. 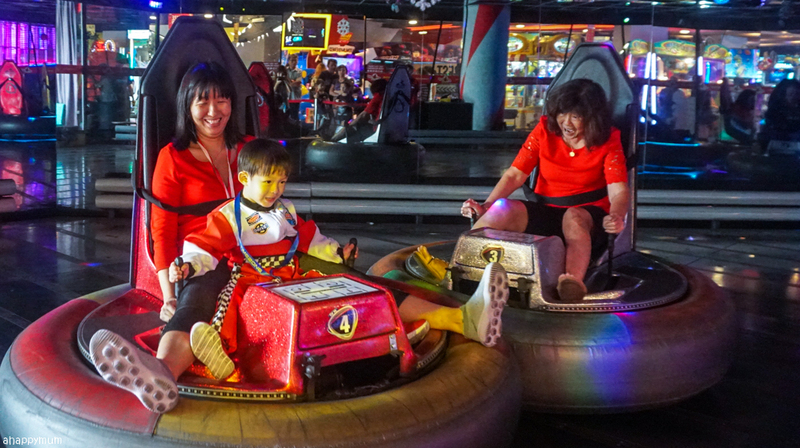 Even the parents and grandparents would be able to join in the fun too, doesn't that sound awesome? 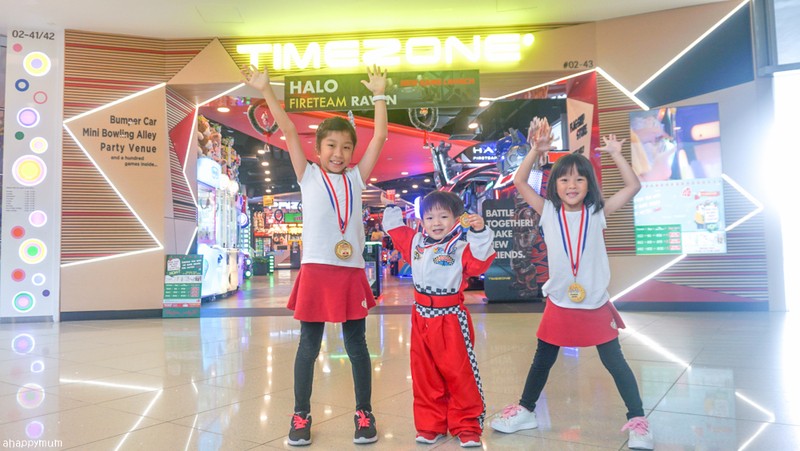 Thanks to Timezone Singapore, we made it happen and yes, it was such a success that I had kids coming up to tell me "This is the BEST party ever!" 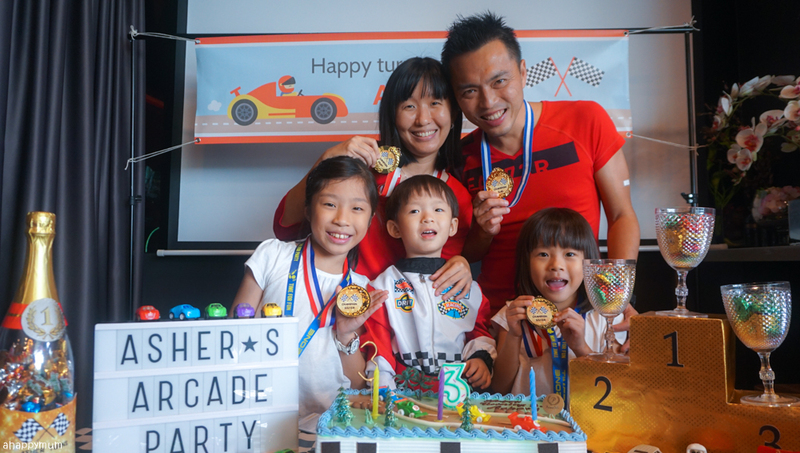 Here's sharing more about our arcade party and all the highlights that took place. You can take a look at the package details at the end of the post if you are keen and don't forget to check out our video on YouTube too! 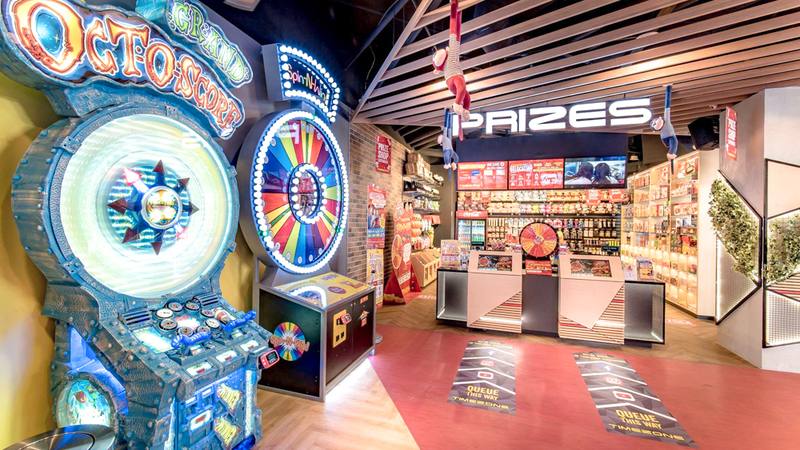 The first Timezone Family Entertainment Centre opened in 1978 in Perth, Western Australia. 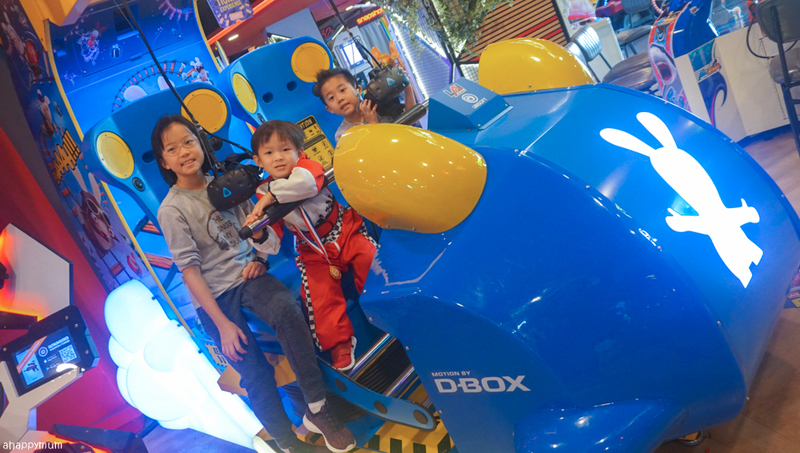 It was the first family oriented video amusement facility at that time and even though it has now established itself in more than 200 locations worldwide, this family emphasis is still a key focus of the brand today. 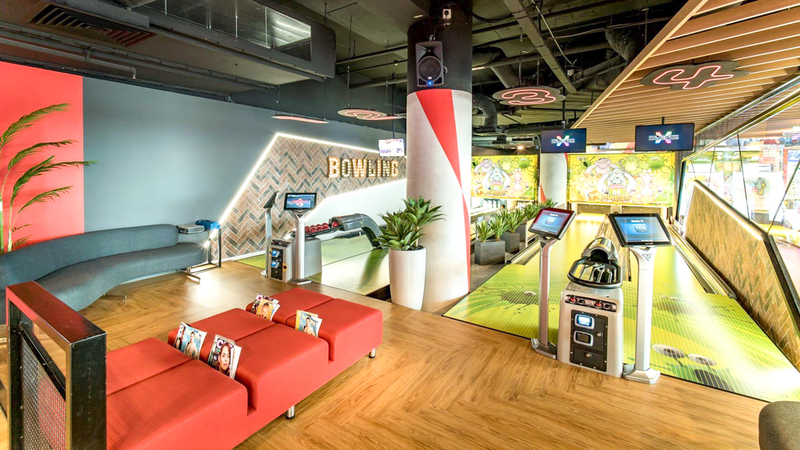 With 12 outlets spread out across Singapore, you are likely able to find an accessible and convenient location for your family entertainment. Did you know? 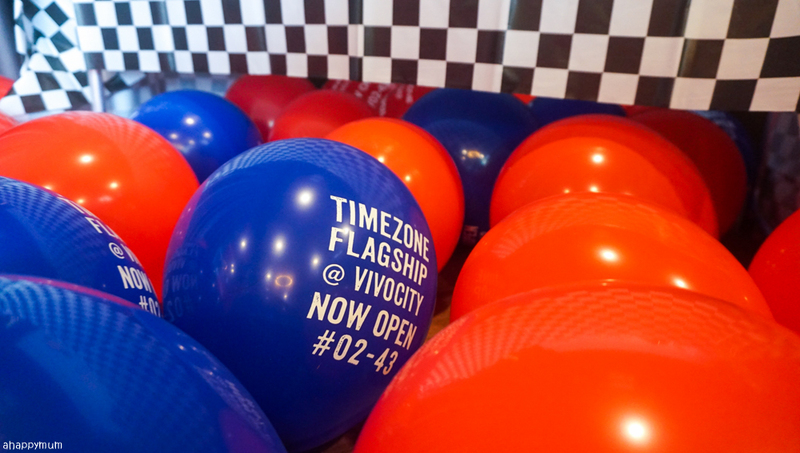 Timezone @ VivoCity (#02-43) is now the flagship store and boasts over 12,000sqft of non-stop entertainment. 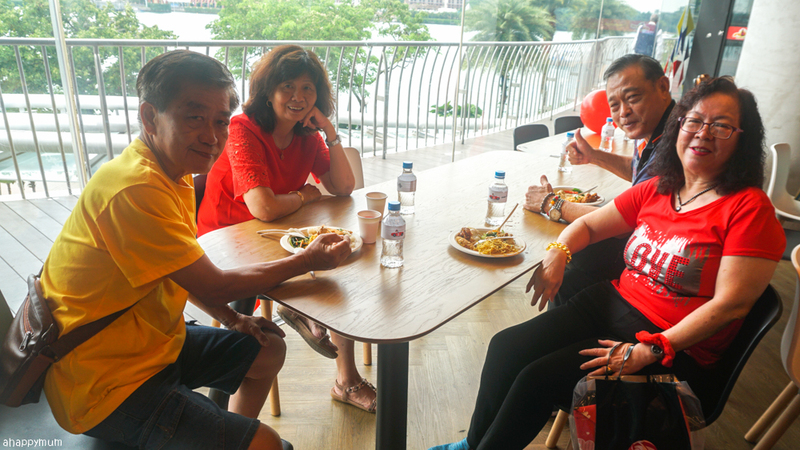 We've been to the VivoCity outlet various times over the previous years but since it revamped and reopened in early 2018, we had yet to visit so this was our first time - and the start of many more to come! 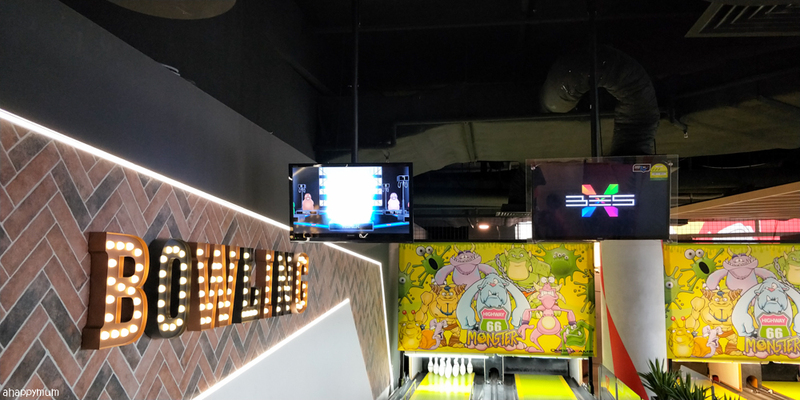 If you are unsure of where it is located, just follow the signs to Golden Village because the arcade is just a stone's throw away from the cinema. You won't miss the striking, glaring yellow signboard when you are there! 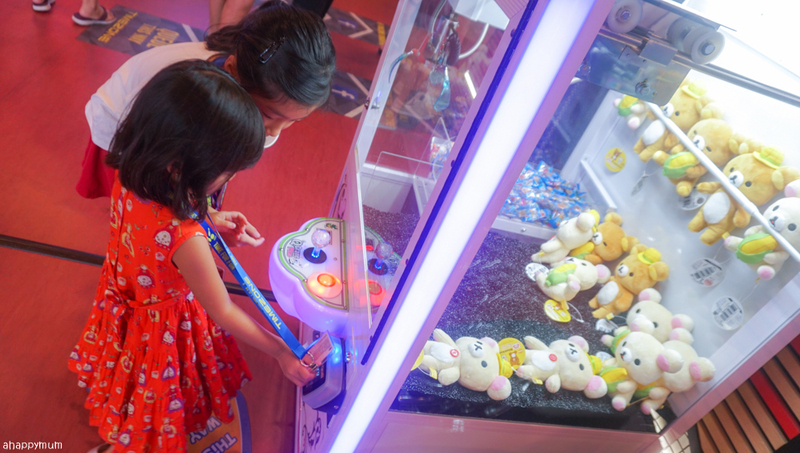 The moment we entered the arcade, we went "This place is HUGE!". 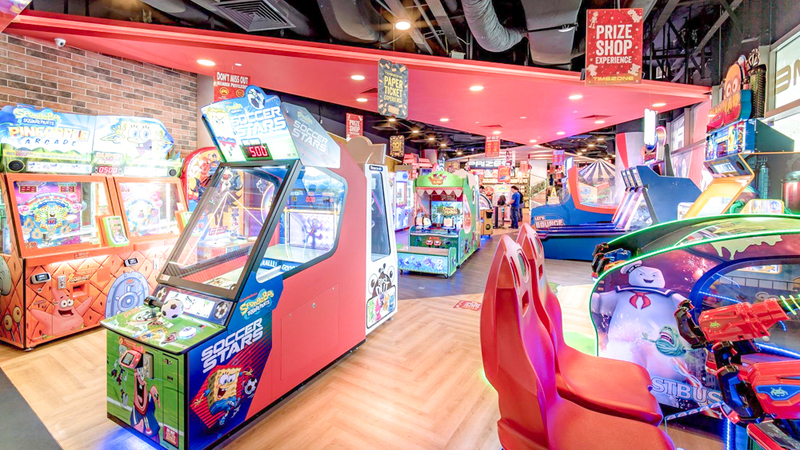 Yup, it was welcoming, colourful, spacious and easy to walk around, and there were so many types of games - some of which we had never seen before in other arcades - which really excited all of us. 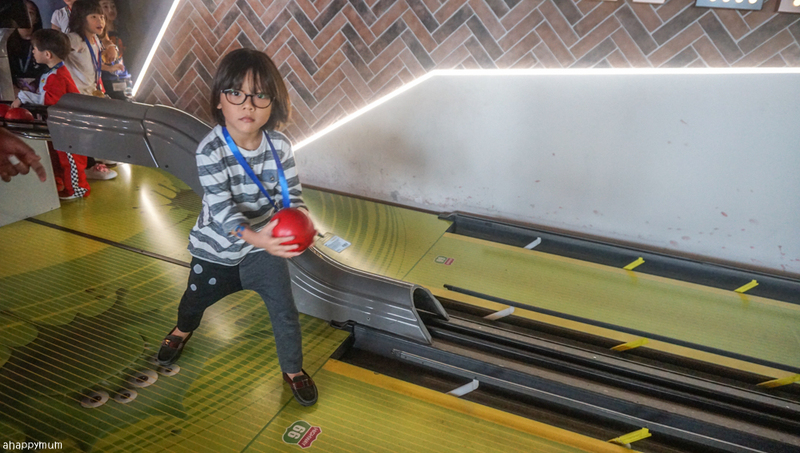 Check this out, they even offer Bowling alleys (proper, long ones and not the short, mini ones) and a new Bumper Car attraction too (read more about this below). 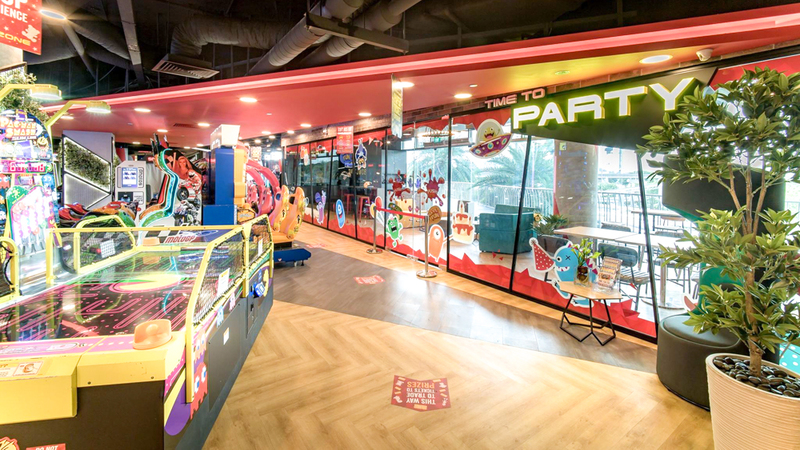 I was expecting to see a small, function room for hosting parties because I assumed that there wouldn't be much space left after having so many bulky game machines. Boy, I was wrong! 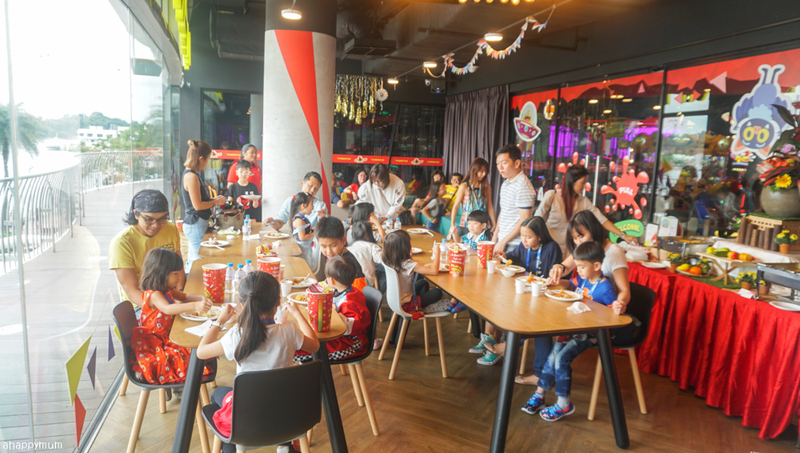 The party room in Timezone @ VivoCity was one of the best we had ever seen because not only was it roomy, cosy and inviting, it also had floor-to-ceiling glass windows which allowed an abundance of natural light to shine in. It made me feel cheery just walking into it, knowing that this would be the place my boy was going to have his party. There were plenty of dining tables and chairs, a sofa seating area, space to set up the buffet, a small area for setting up a party backdrop or dessert table, a sink for washing up, a microwave for easy heating of food and a bar fridge to store the birthday cake. Yup, definitely more than enough to suffice my needs as a party planner. 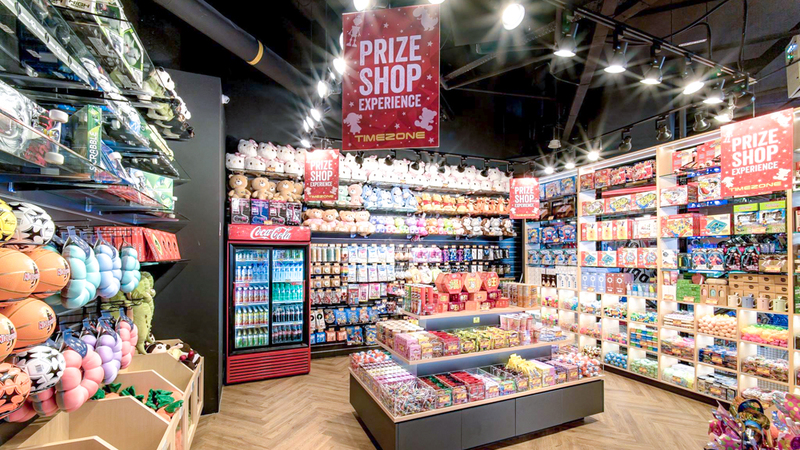 The Prize shop also offers a selection of rewards for the kids to pick out and it's definitely one of our highlights from every visit to the arcade. 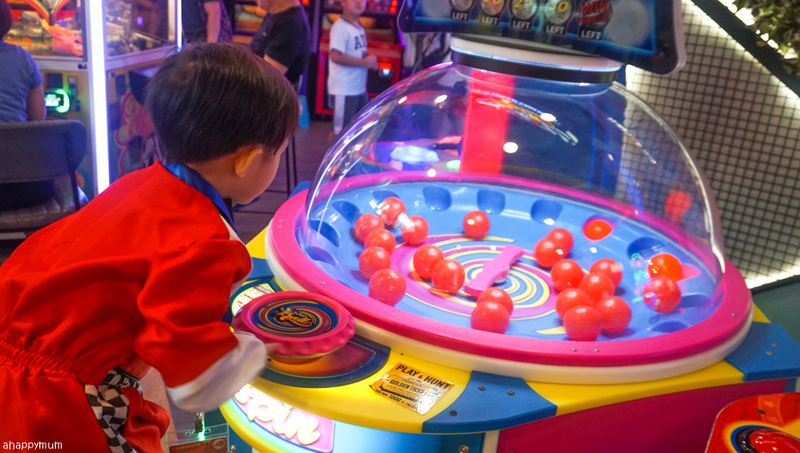 By the way, Timezone @ VivoCity uses the old school ticketing system and the kids can collect their tickets and keep them inside a cup as they go around playing. 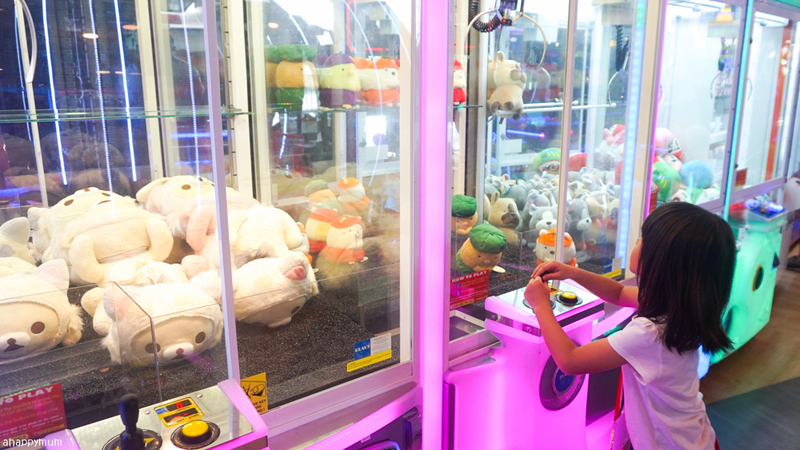 At the end, they just need to redeem the tickets at the counting machines - my kids always love to 'feed' these machines with all their tickets - and exchange for prizes! 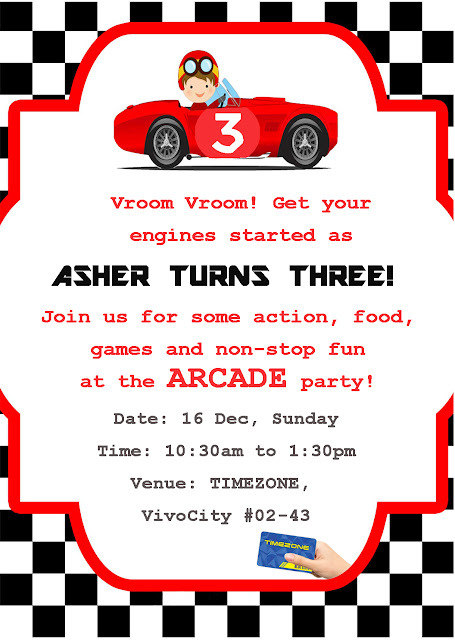 Before we move on to our party, take a look at our birthday invite to see our theme! Ready, get set, GO! 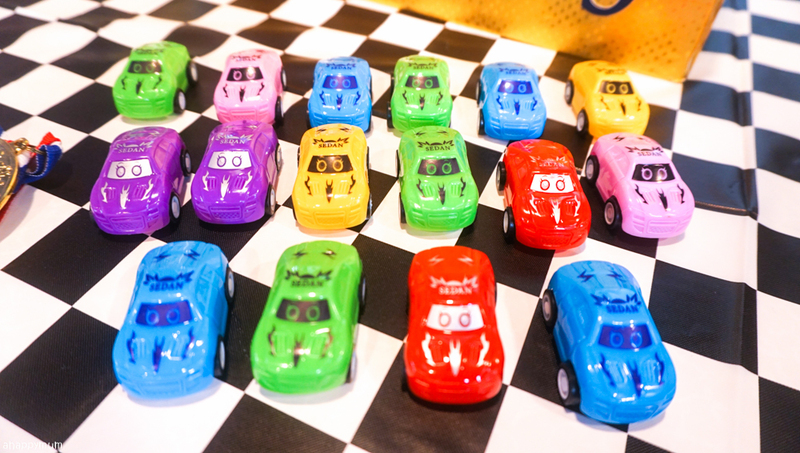 Yup, we decided on a race car theme for the boy, who loves zooming around the house in his toy car nowadays, and I sourced online for the props, race car driver costume and other related decorations. 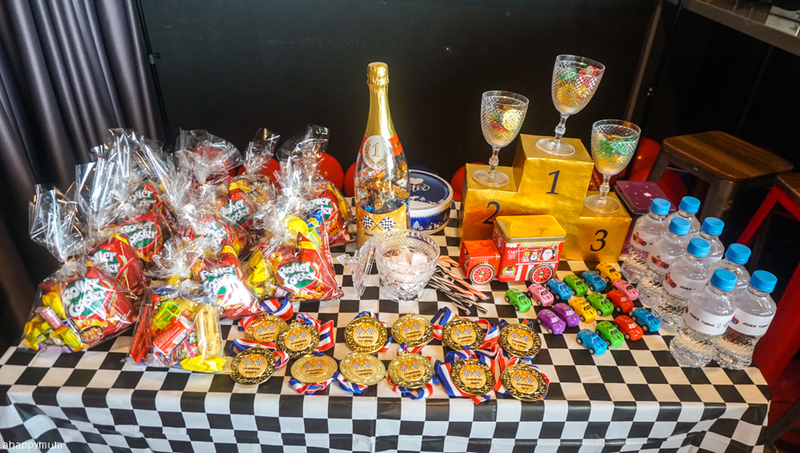 As always, I like to add in a personal touch and DIY some of the party decorations, so I came up with the idea of doing a trophy podium, a champagne bottle and customised medals as party favours for the guests. The podium was cut out of an empty box and wrapped with gold wrapping paper. The plastic glasses from Daiso made a perfect fit on top of it and we filled them up with gold chocolate coins. The champagne bottle was filled with treats and I stuck on customised labels - done using Powerpoint - on both the front and back. The medals, also bought from Daiso, were done up the night before and I printed out names of the guests for the front, for instance " Champion Ewan" and a thank you message for the back. 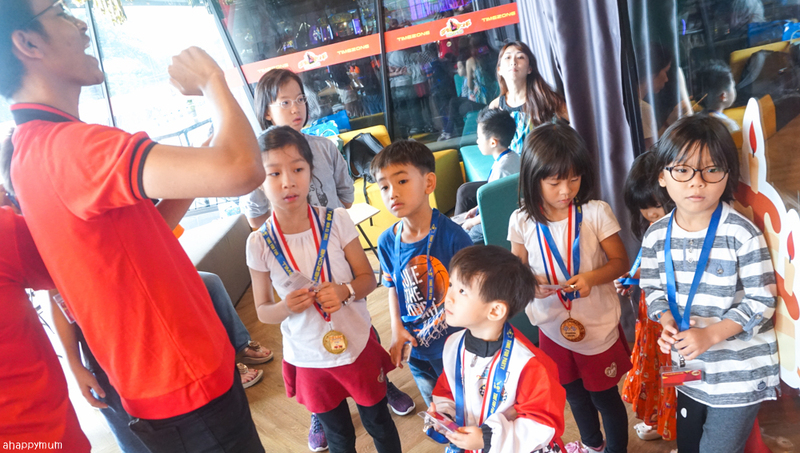 Many of the kids were so happy to see their names and thanked me profusely for their medals. Awwww. 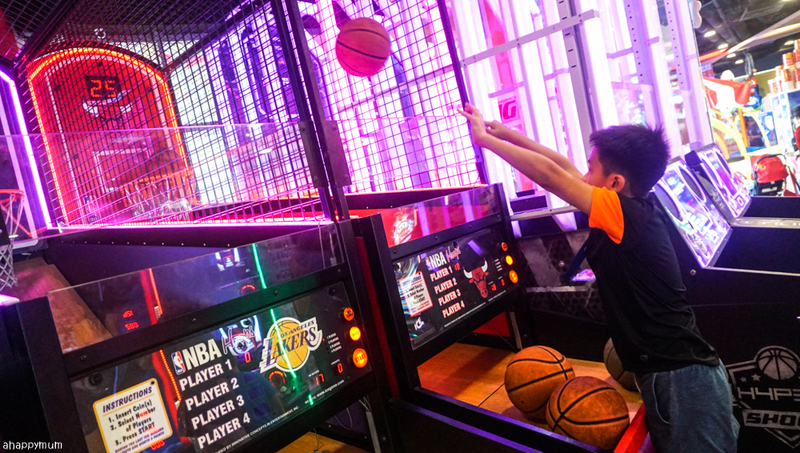 Back to the party, just so you know, Timezone offers three time slots for parties: 10:30am-1:30pm, 2pm-5pm and 5:30pm-8:30pm. We took up the morning session and were allowed to enter the arcade half an hour before to do the set up. Let's begin! 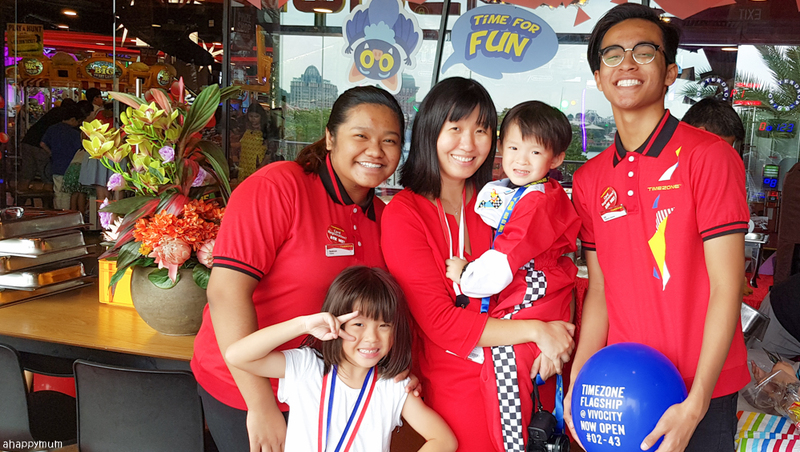 There were two staff, Syakirah and Alif, who were allocated to help out at our party and the first thing they did was to inflate lots of balloons! I was half thinking of rushing out to get balloons in the morning and was feeling thankful that I didn't because they blew up so many of them for us, which totally delighted the birthday boy. 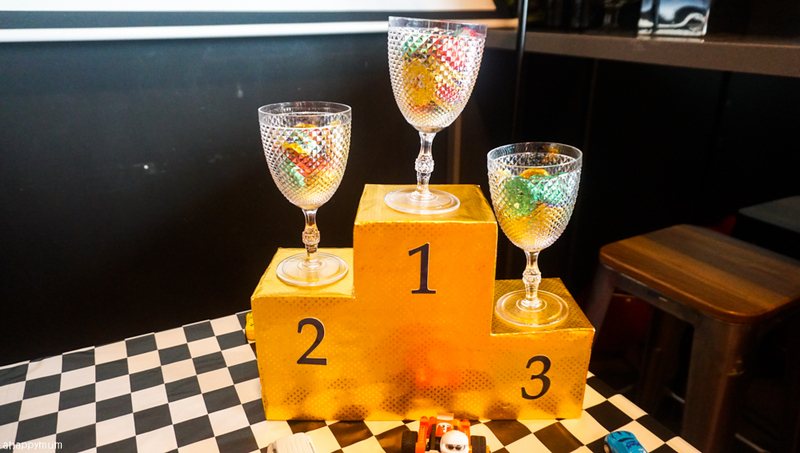 I kept all the other decorations simple for the party because of the time contraint and because I knew everyone would obviously be more interested in the games! Haha. 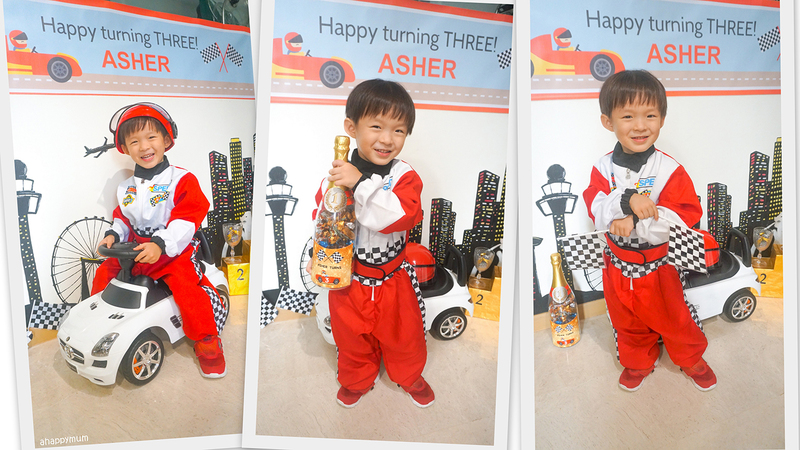 We brought along a foldable table to set up and also a photo backdrop stand so we could hang up the birthday banner. 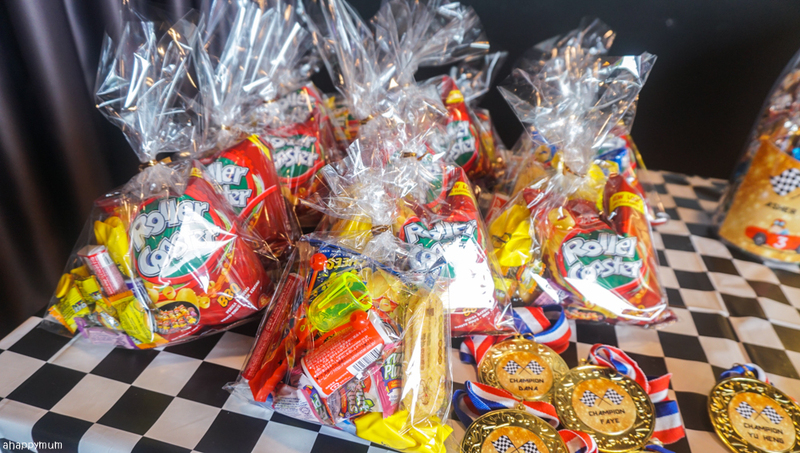 One good thing about having a Timezone party is that all goodie bags are taken care of. Yup, for the first time this year, I didn't have to fuss over what to give out to the kids who come to our party but could instead leave it to the staff, who packed these snacks and toys neatly for us to distribute to the little ones. 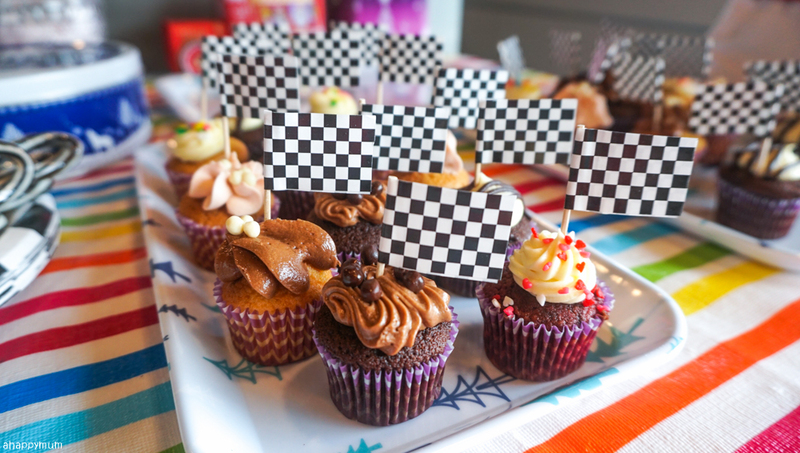 We also brought along cupcakes from Twelve Cupcakes, chocolate eclairs and fruit tarts from Prima Deli and more - and added checkered racing flags toppers on each of them. Cute, right? 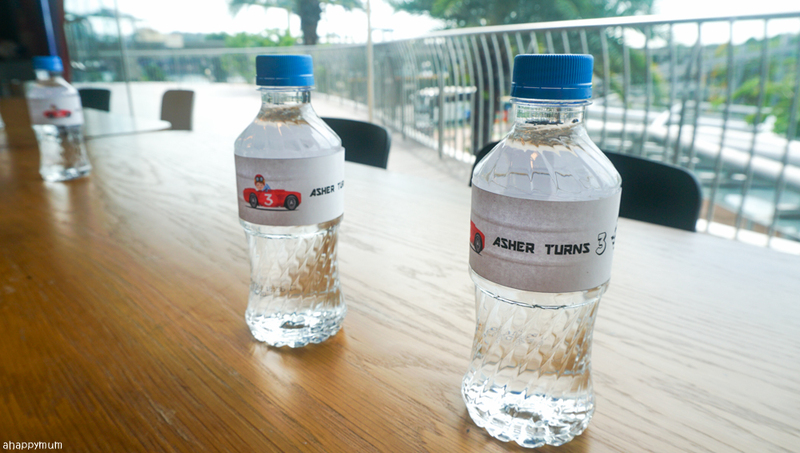 To make sure everyone was hydrated from all the playing, we also gave out bottled water and of course, these had personalised labels too! Every kid who attended the party simply couldn't wait to start playing - which explains why many of them told me they were looking forward to this day so much. 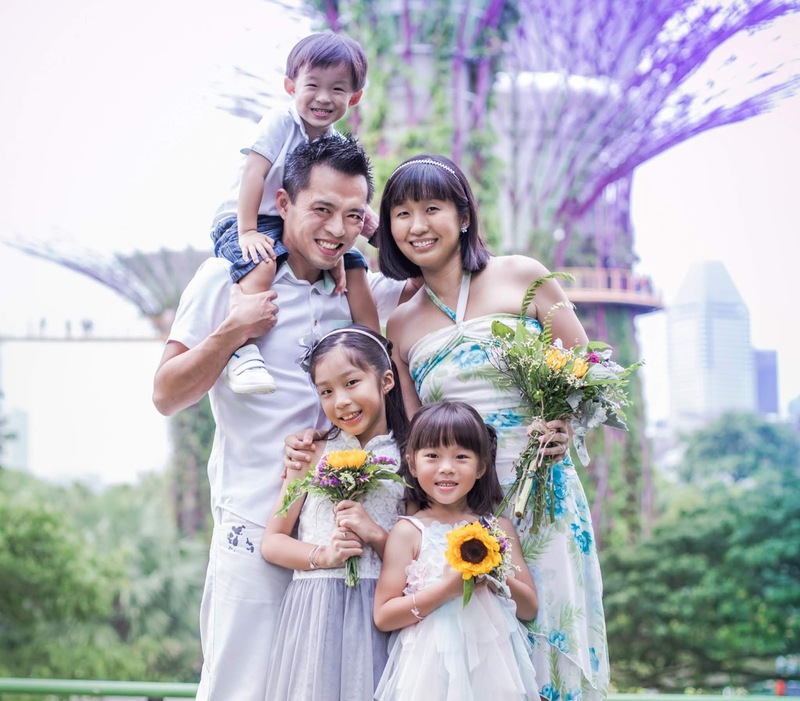 We had a total of 15 kids, which is the maximum limit, and their ages ranged from three years old (Asher was the youngest!) to 13 years old. 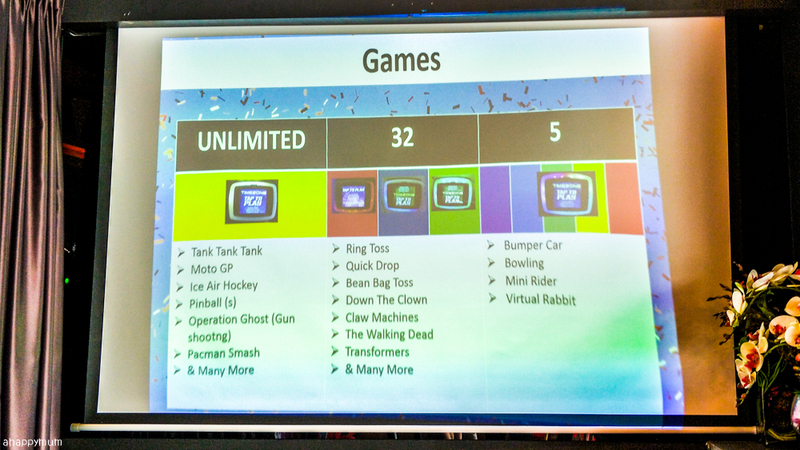 Yup, with such a huge range, it would be hard if I would planning for games which would be suitable and fun for all, but with the whole arcade at our disposal, you bet there would be something - in fact, lots of things - for everyone. 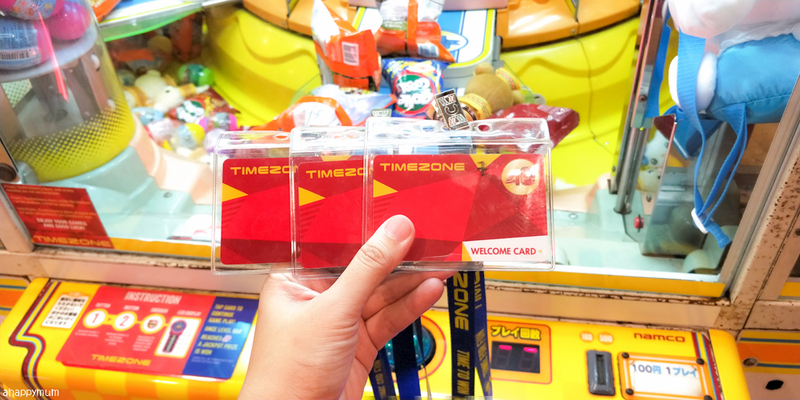 Before the little ones could start playing, they had a quick briefing by Alif who gave each of them a Timezone pass - a game card with a lanyard so they would not lose it - and simple instructions to follow. Within minutes, all of the them dashed out excitedly and that's when the partying began. 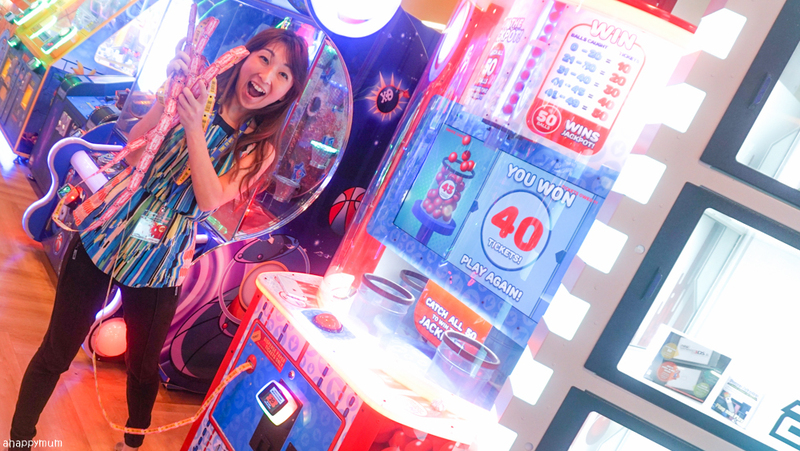 Here's sharing some of the highlights and the reasons why we love this arcade party so much. 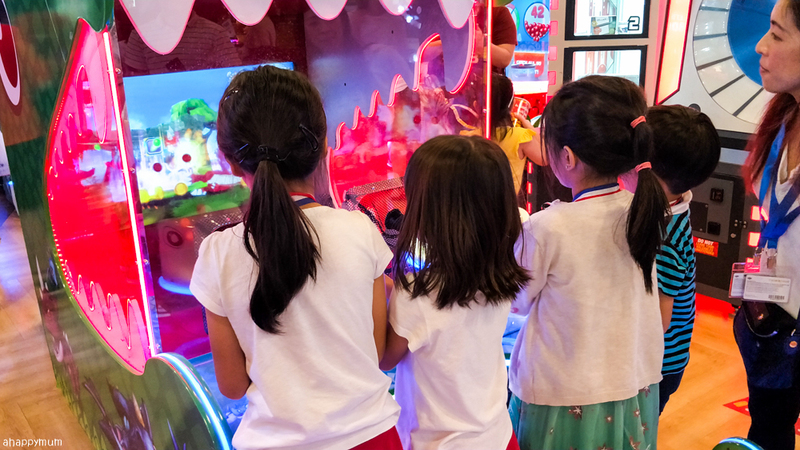 A big part of the joy for the kids comes from being able to play WHATEVER you want! Well, almost whatever. 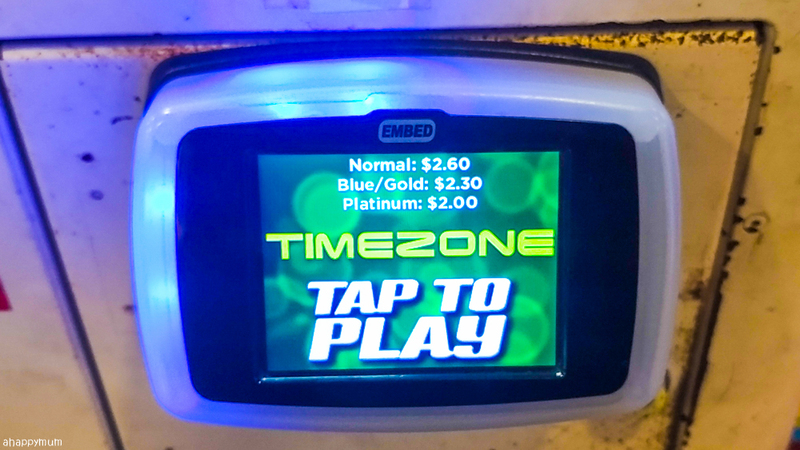 Every kid gets to unlimited YELLOW card reader games, any 32 RED, BLUE and GREEN card reader games and 5 RAINBOW card reader games (you can determine the colour from the reader where you swipe your card to play, see a blue example below). Our party lasted three hours and apart from the lunch and cake cutting ceremony, the entire time was spent on playing the games - and none of the kids finished up their card before the party ended. That means everyone had the freedom to try out and play many of the games - some of which they might not have tried before - which was why they were so excited and couldn't bear to stop. We were told that we could also play a couple of games in the party room, such as musical chairs and see-who-can-blow-the-biggest-balloon. 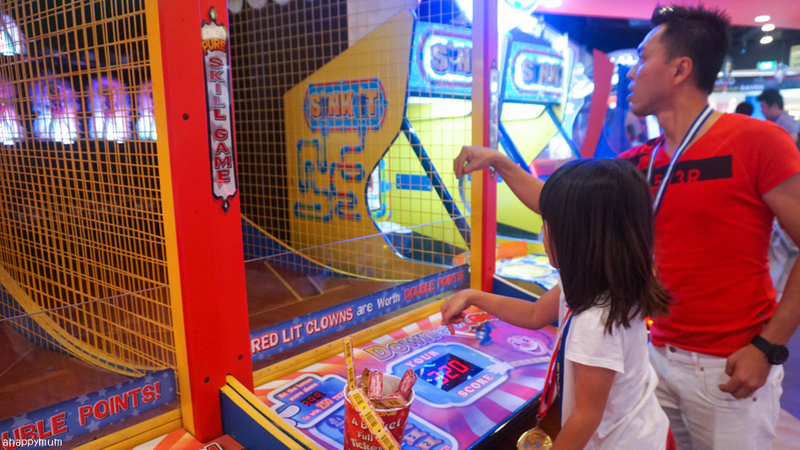 Well, I guess it's not surprising that these kids chose to skip those games that come with rules and only one winner, but instead spend the time in the arcade where there are no bars held and everyone is a winner. 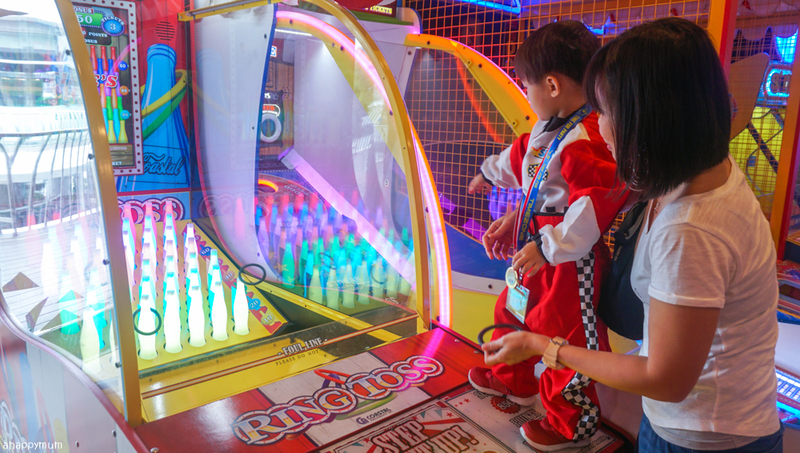 Timezone @ VivoCity, with its vast range of both traditional and modern arcade games, provides a platform for kids to have non-stop FUN for those few hours. 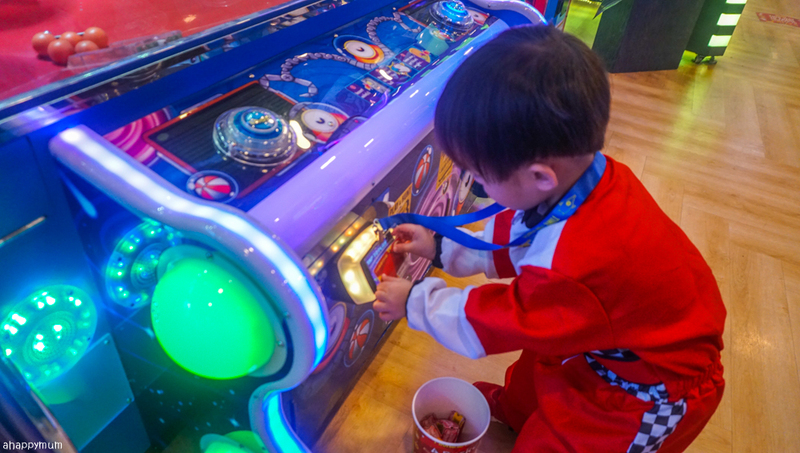 We like hanging out at the arcade but we don't go often nowadays because it can be pretty expensive. 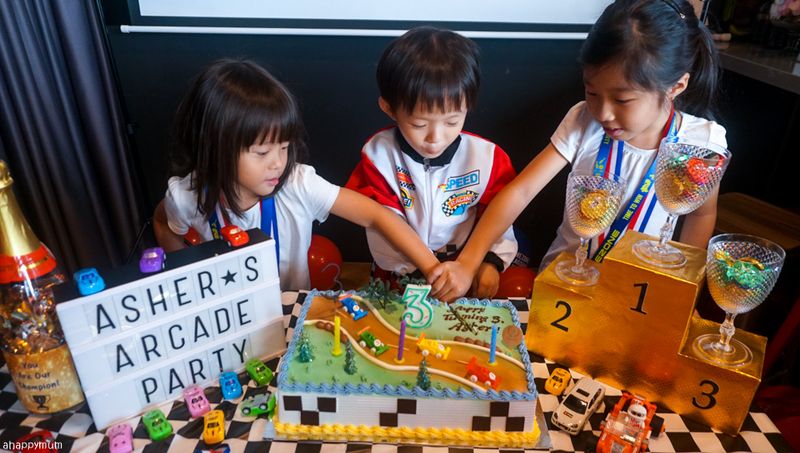 Thus, having a birthday party is a legit excuse for the kids to go crazy and have as much fun as they can squeeze in within that short span of time. 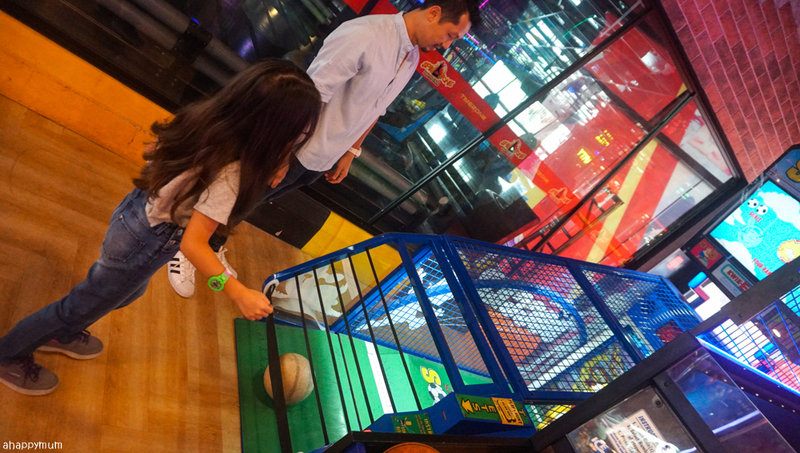 From the more old school games like basketball, spin the wheel, gun shooting, car and motorbike racing, claw machines and whack-a-mole to the newer ones like VR rides, bowling, DDR and even bumper cars, there is bound to be something for everyone to enjoy. 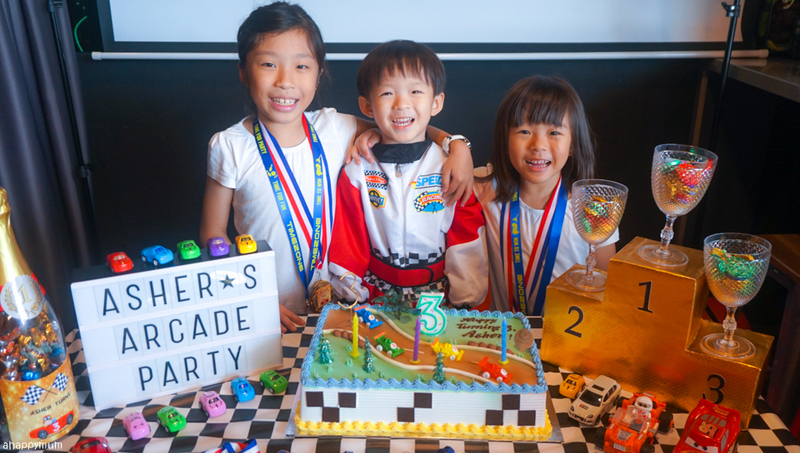 It's a great way to the birthday boy to spend time with his friends and cousins too, knowing that everyone is enjoying every moment of this party. 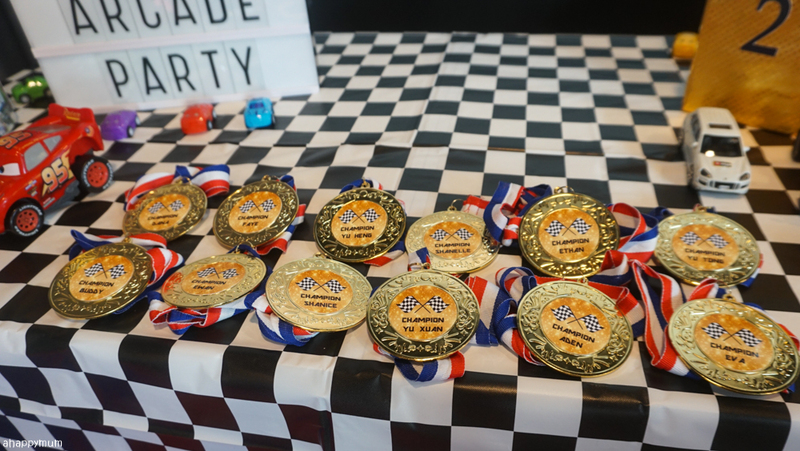 As for me, it's seriously the least hands-on party I've organised because I could leave the activities to.... the arcade machines, which are by far more exciting than the games I can conjure up. That also means I have time to take more photos, breathe more and even join in the fun too! 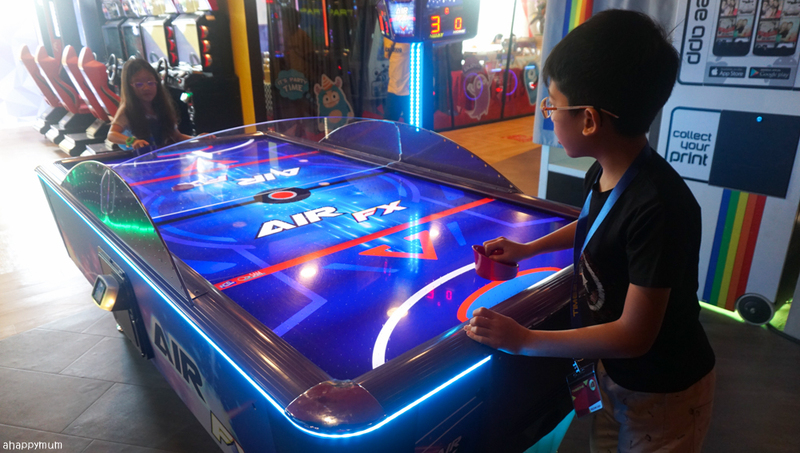 While it was awesome seeing how the kids were having a ball of a time, the even better part, for me, was to see how this arcade party allowed families to come together, let their hair down on a weekend morning and just have fun together as kids, parents and even grandparents too. 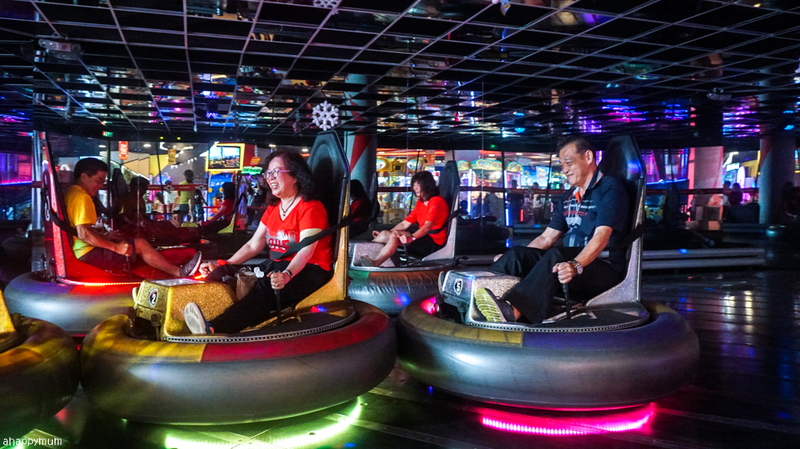 I mean, when do we actually make time to bring our parents to the arcade or do we just assume that they don't like playing the games? 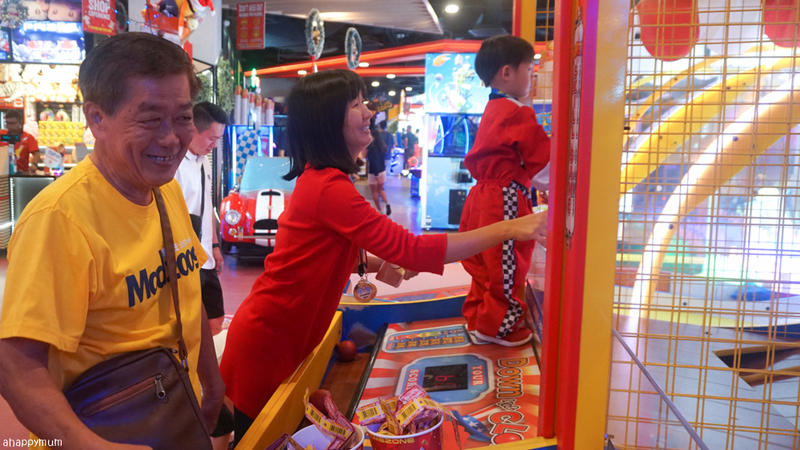 I, for one, know that my Dad and Mum love playing carnival games so this time round, I urged them to join in the party with the grandchildren and they had fun playing old school games like Down the Clown and trying out some of the newer ones like Beer Pong too! It was also nice to see some of the fellow parents bonding with their kids over the games too because I really wanted everyone to just have a good time. 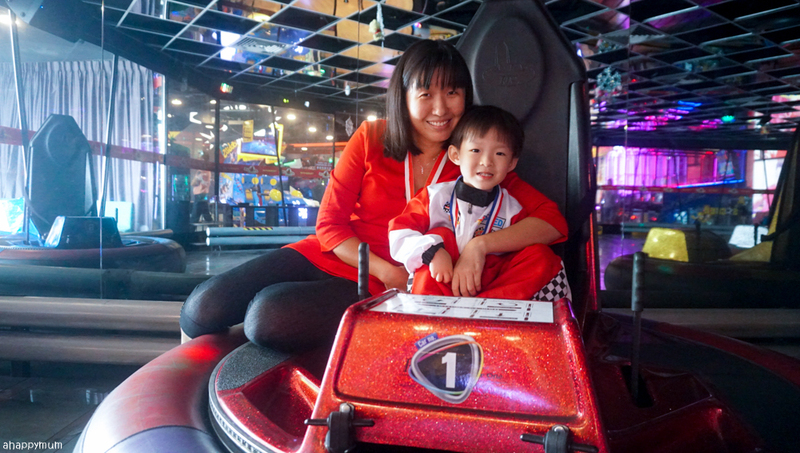 If you were to ask what our favourite game was, it would definitely be the Bumper Car! Asher was so lucky to play it not once, but twice and he was squealing with laughter throughout both sessions. It was the first time he had the chance to play with ALL of his grandparents and that was a classic, precious moment seeing how they were were laughing, enjoying and trying to make each other fly. Haha. Awwww, I'm so glad it happened the way it did. 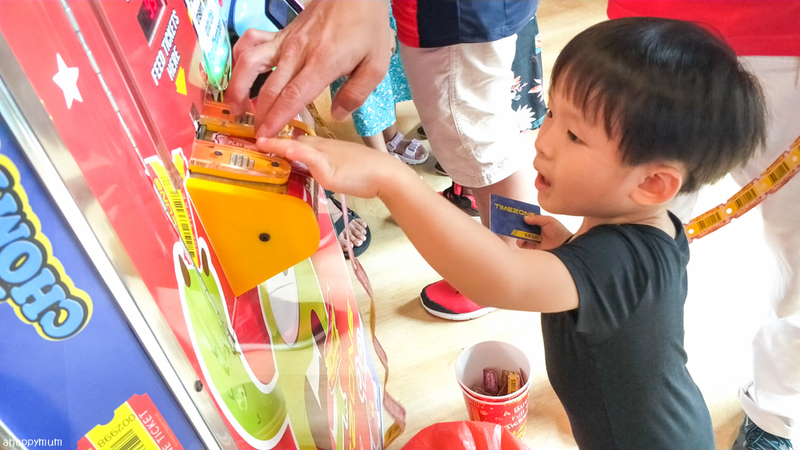 Once our session ended, our cards stopped functioning - much to the disappointment of the kids who just wanted to play all day long - but at least we could use the tickets we earned to exchange for prizes! 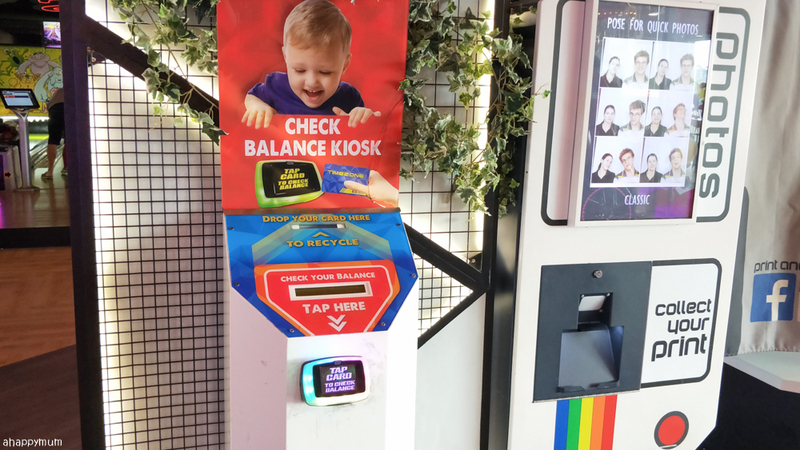 You can check your card balance at one of the kiosks and if you have any printed tickets, don't forget to bring them to the ticket count machines too so you can accumulate all of them and trade for a gift of your choice. I guess the only thing that could make the kids stop playing - for a while - was good FOOD! Thanks to On and On Diners (which we previously engaged for Ariel's party), all the guests had their tummies filled and even back came for second and third rounds. You know, I brought along so many containers thinking that we would take home the leftovers from the buffet but in the end, there wasn't much food left! Nope, we didn't order too little and in fact, I accounted for all the kids and even the younger ones. That was how delicious it was and how much our family and friends seemed to like it. 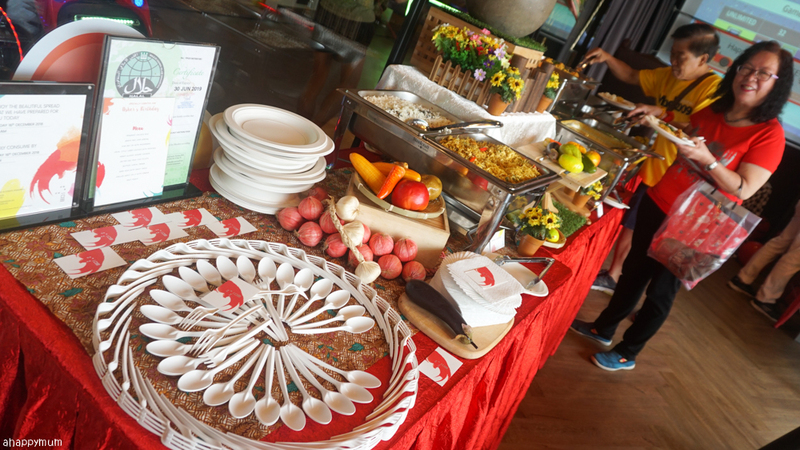 Even the buffet set up was very impressive, I mean, just look at the level of detail! 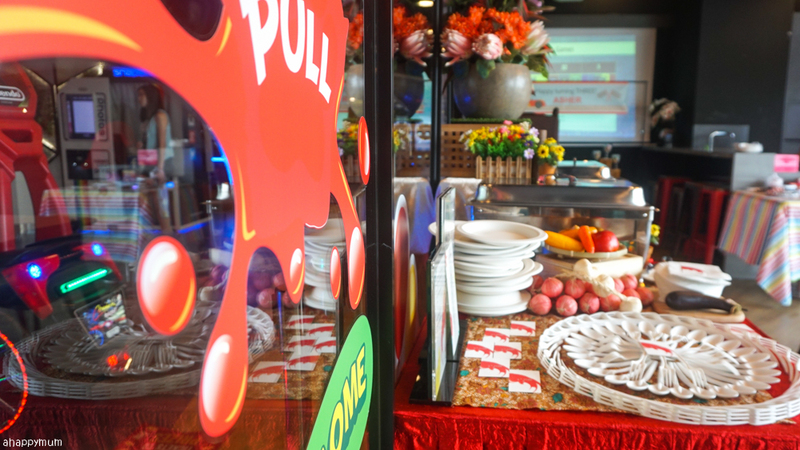 I was pleasantly surprised by how much effort went into it and the staff did everything they could to beautify the buffet table and make it look welcoming and presentable. 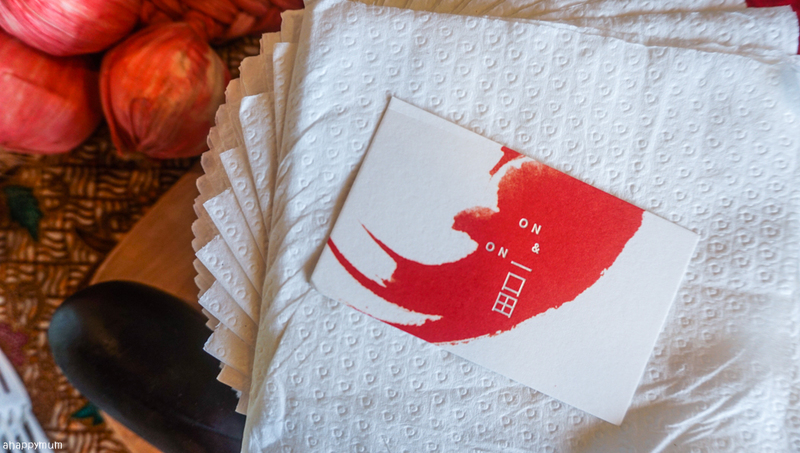 It's one of the best caterers we've encountered so I do think it deserves another write-up of its own, so stay tuned! See what I mean when I said the party room is filled with natural light? 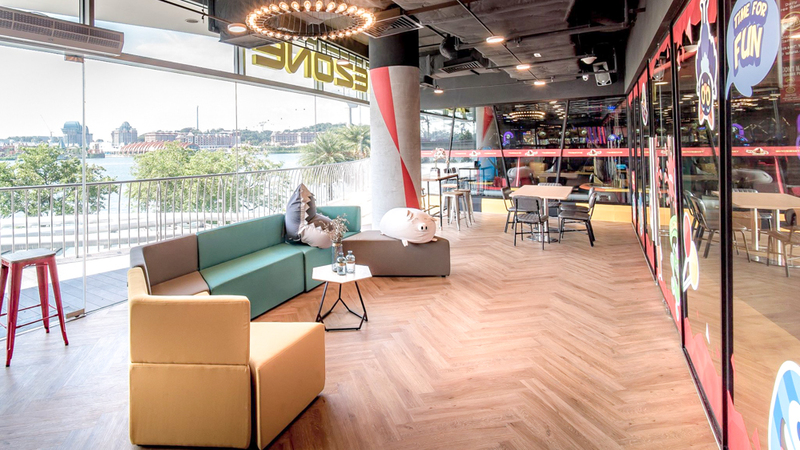 It even comes with a picturesque view of the waterfront and makes a perfect place for the adults to chill out and take their time to indulge in the food while the kids have fun outside too. Perfect! 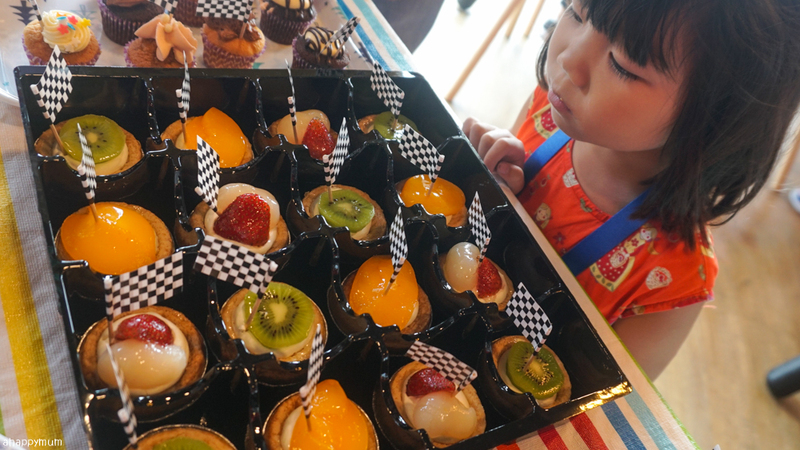 Our dessert table was also well-liked by the kids and it was nice to see them coming over to try out the cupcakes, tarts, eclairs and more. It might be sugar overload, but well, it's the festive period after all so well, never mind and be happy! Pssst, this is already our third party in the span of less than a month! Yup, that's what happens when you have three kids whose birthdays fall close to one another. 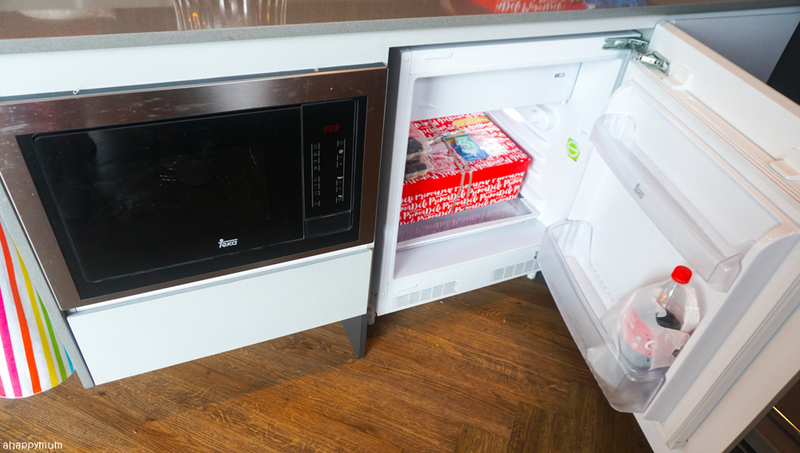 Having a fridge in the party room makes it so convenient for us to store the cake and take it out just before the cake cutting ceremony. We ordered a 2kg chocolate cake from Prima Deli and collected it from their outlet just downstairs so that we didn't have to bring it all the way from our house too. 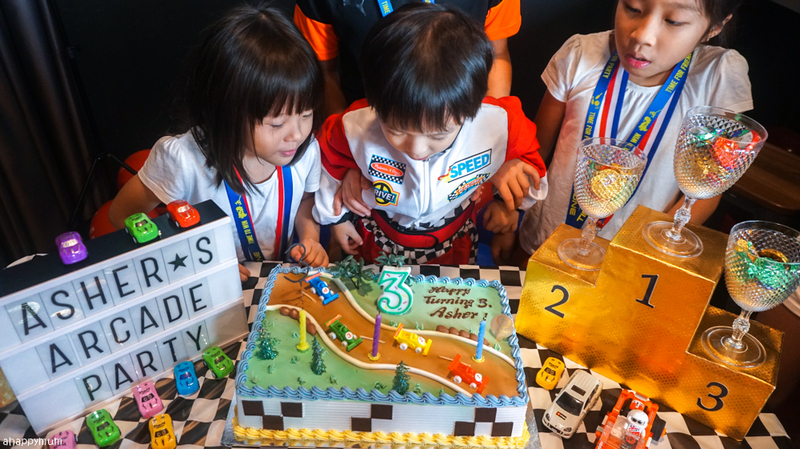 Here, check out our racing car birthday cake! Not bad looking, right? Of course, before we cut the cake, we had to do the mandatory photo-taking session first! 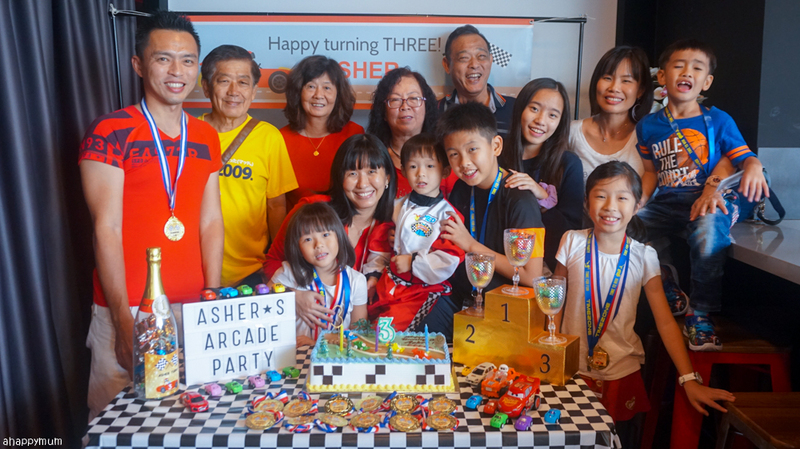 Even though the friends were eager to rush back to their games, I was thankful that they stayed on with no complaints and helped the birthday boy to celebrate his special moment. 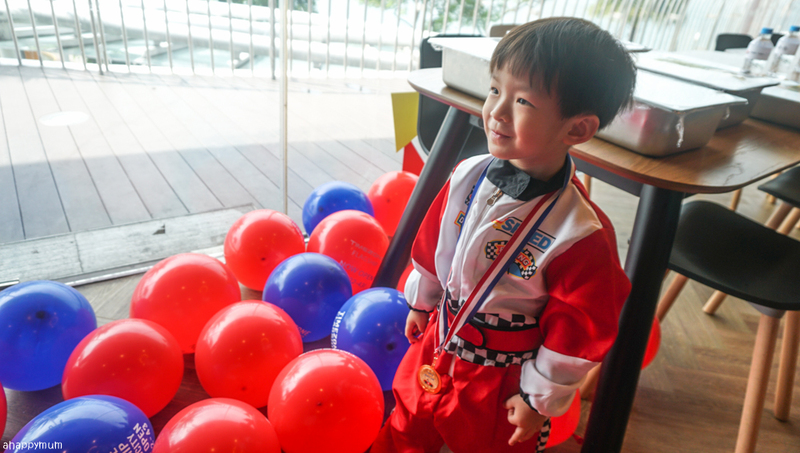 Many thanks also go the grandparents for being so sporting and attending his party! These are fond, priceless memories that will last us forever. It's still hard to believe that just like that, this boy has turned THREE! Sometimes, I wish that I could stop time so that these little ones stay little a while more and don't grow up so fast. Have you ever wished for that too? 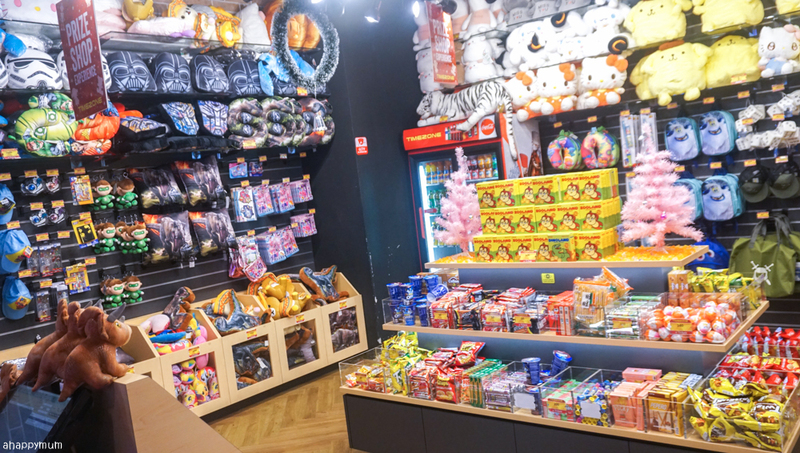 Before the party concluded, we were told by the Timezone staff that the birthday boy was entitled to pick a plushie from the Gift Store and bring it home as his present. Woohoo! 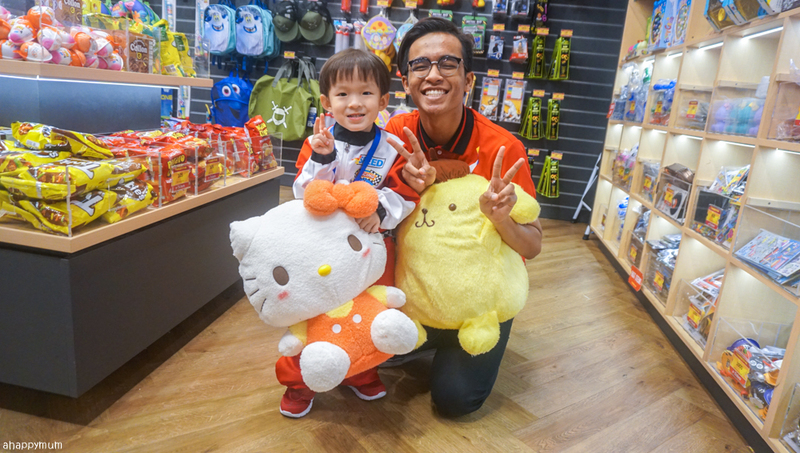 I was hoping he could choose some other gifts like toys or sweets but nope, he only had a choice between Hello Kitty or Pom Pom Purin and he chose the former in a heartbeat. Yup, thanks to his sisters, he is quite acquainted with the cat and I would like to believe that he chose that so he could share with them too. Haha. In any case, it made him smile and he was happy to hug it right away, so thanks a lot for the sweet gesture and for making his party such a memorable one, Timezone! This was definitely a birthday to remember! 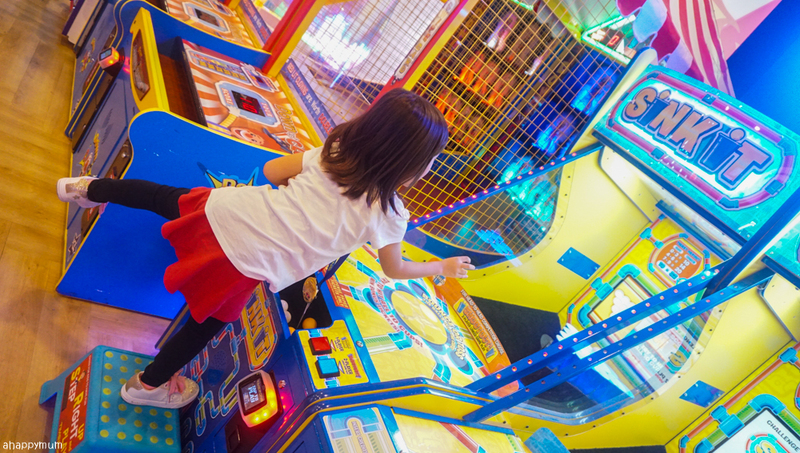 I know the kids will be talking about it for a long, long time and we will definitely be back at the arcade soon for more family fun and play! 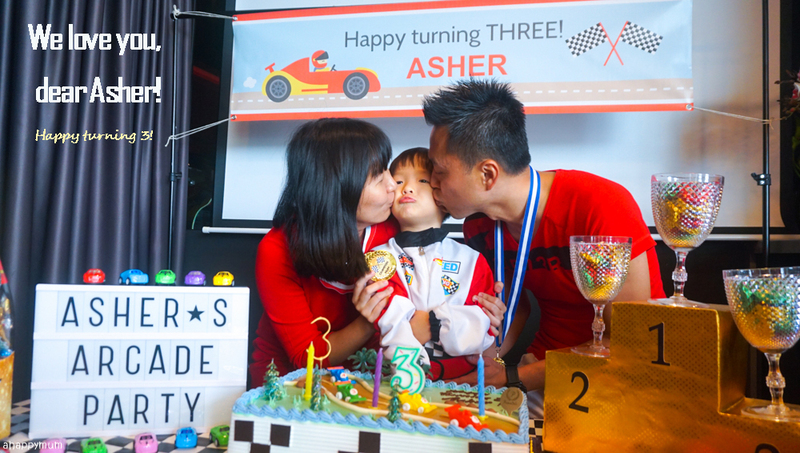 Happy turning three, dear Asher and we love you so, so very much! May you stay happy, bubbly and live life to the max every day! Here's a video to showcase some of the highlights from the party and to help us remember this happy day. 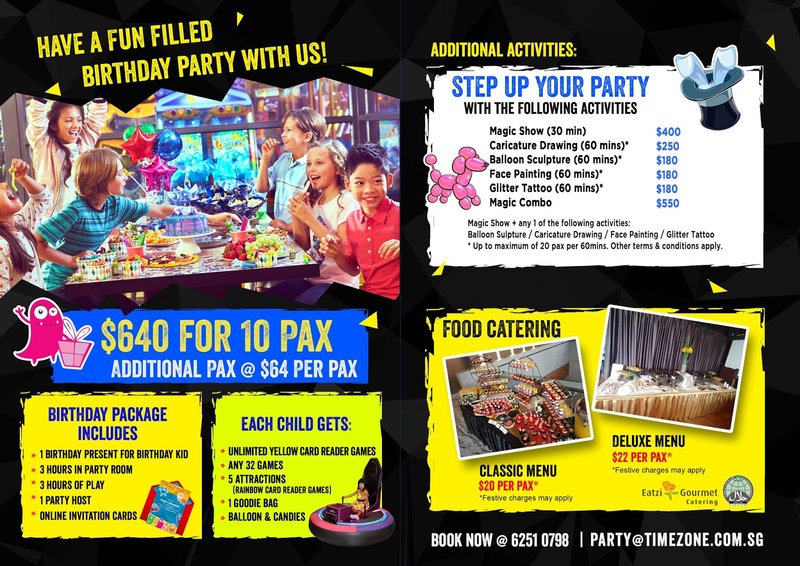 For those of you who are keen to explore an arcade party at Timezone, here are the package details. The fringe activities are optional and you are allowed to bring in your own food too. From now to end of June 2019, you can enjoy 10% off when you make your booking by quoting "SUMMER10". 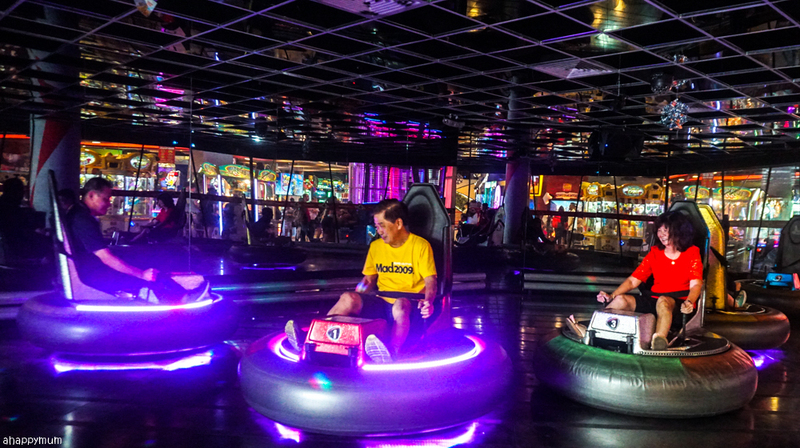 I'm pretty certain that all the kids, and even the adults, will have a blast like what we did, so have fun and enjoy! 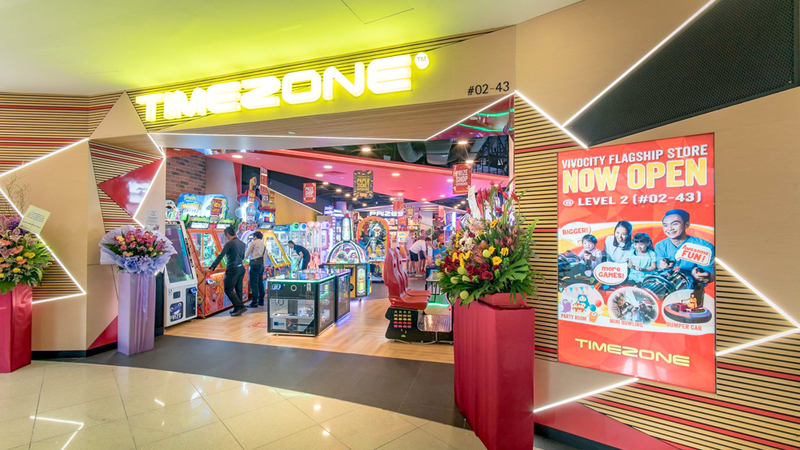 To find out more information about Timezone, including its outlet locations, promo packages and latest games and attractions, visit https://www.timezone.com.sg or their Facebook page. Disclosure: This is a collaboration with Timezone and Asher's party was kindly sponsored by them. All photos, unless mentioned otherwise, belonged to us. All opinions are purely our own.